To register for the examinations, the enrolled applicants may go to the SWAYAM portal and proceed to login for exam registration. The SWAYAM examination 2018 will be held in December month. According to a notice posted on the official website of Ministry of Human Resource Development (MHRD), the SWAYAM examinations will be held on December 1 and 2, 2018. Students who have enrolled for SWAYAM courses can now register for the examination till October 29, 2018. To register for the examinations, the enrolled applicants may go to the SWAYAM portal and proceed to login for exam registration (follow the steps given in this story to register). Courses delivered through SWAYAM are available free of cost to the learners, however, according to the MHRD rules, students who are wanting certifications may register and will be offered a certificate on successful completion of the course, with a little fee. SWAYAM platform is indigenously developed by MHRD and All India Council for Technical Education (AICTE) with the help of Microsoft and would be ultimately capable of hosting 2000 courses and 80000 hours of learning: covering school, under-graduate, post-graduate, engineering, law and other professional courses. At the end of each course, there will be an assessment of the student through proctored examination and the marks/grades secured in this exam could be transferred to the academic record of the students. 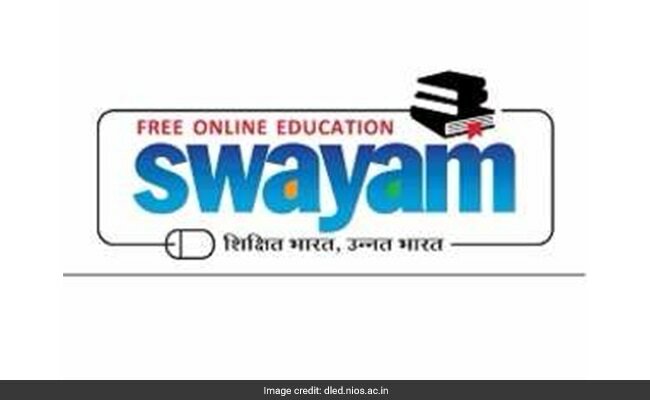 UGC has already issued the UGC (Credit Framework for online learning courses through SWAYAM) Regulation 2016 advising the Universities to identify courses where credits can be transferred on to the academic record of the students for courses done on SWAYAM. 1. Visit the SWAYAM portal -- swayam.gov.in -- and click on button "Apply for Exam"
The courses are done through an indigenous developed IT platform that facilitates hosting of all the courses, taught in classrooms from 9th class till post-graduation to be accessed by anyone, anywhere at any time. All the SWAYAM courses are interactive, prepared by the best teachers in the country and are available, free of cost to the residents in India, according to the official website of SWAYAM. More than 1,000 specially chosen faculty and teachers from across the Country have participated in preparing these courses. The courses hosted on SWAYAM are in 4 quadrants - (1) video lecture, (2) specially prepared reading material that can be downloaded/printed (3) self-assessment tests through tests and quizzes and (4) an online discussion forum for clearing the doubts. In order to ensure best quality content are produced and delivered, MHRD has appointed nine National Coordinators: They are AICTE for self-paced and international courses, NPTEL for engineering, UGC for non technical post-graduation education, CEC for under-graduate education, NCERT and NIOS for school education, IGNOU for out of the school students, IIMB for management studies and NITTTR for Teacher Training programme.